The Battle of Malta took place on July 8, 1283, at the entrance to the Grand Harbour, when a galley fleet commanded by Roger of Lauria defeated a fleet of Angevin galleys. An event of great importance in Maltese history took place 730 years ago on July 8, 1283. Known historically as the Battle of Malta, it directly involved the small Maltese population who had revolted against the Angevins. This episode must be seen in its proper perspective. From 1194 until the arrival of the Knights of St John, the Maltese islands were ruled by the Kingdom of Sicily, during which period the full Latinisation started to have its effects on Malta. The first effort to oust the Arabs from these islands occurred in 1091 when Count Roger I of Sicily made an initial attempt to establish Norman rule of Malta and was greeted by the few native Christians. In 1127, his son, Roger II of Sicily succeeded where his father had failed. This marked the gradual change from an Arab cultural influence to a European one. In 1191, Tancred of Sicily appointed Margaritus of Brindisi as the first Count of Malta. After the Norman conquest, the population of the Maltese islands kept growing mainly through immigration from the north (Sicily and Italy), with the exile to Malta of the entire male population of the town of Celano, Italy, in 1223, the stationing of a Norman and Sicilian garrison on Malta in 1240, and the settlement in Malta of noble families from Sicily. Due to this, the contemporary men of Malta most likely originated from southern Italy, including Sicily and up to Calabria. A year prior to the Battle of Malta, an event of great importance had occurred in Palermo, Sicily. The Sicilian Vespers is the name given to the successful rebellion against the rule of the French king Charles I, who had ruled the Kingdom of Sicily since 1266. The uprising began at the start of Vespers, the sunset prayer marking the beginning of the night vigil on Easter Monday, March 30, 1282. Within six weeks, the rebels slew 3,000 French men and women and the government of King Charles lost control of the island. Although his rule was quite just, unrest was simmering in Sicily because the island played a subordinate role in Charles’s empire. The Battle of Malta took place on July 8, 1283, at the entrance to the Grand Harbour, the principal port of Malta, when a galley fleet commanded by Roger of Lauria defeated a fleet of Angevin galleys commanded by William Cornut and Bartholomew Bonvin. During the fighting, Cornut lost his life. Charles of Salerno, in the absence of his father (Charles I of Naples), had sent the Provençal fleet to relieve the besieged garrison of Malta, which was trapped in the Castello del Mare (the ‘Castle of the Sea’, now known as Fort St Angelo) in Grand Harbour after the inhabitants of Malta had rebelled against the Angevins. This revolt must not be mixed with that against Gonsalvo Monroy. The rebellion of the Maltese and Gozitan populations of 1425-1428 is well known in Malta. The initial violence had erupted in Gozo and spilled into Malta. By 1426, control of the islands finally fell in the hands of the rebelling populations, with Monroy’s garrison and wife Lady Constance de Monroy encircled in the Castrum Maris. Thus, the inhabitants of these islands had always cherished a sense of freedom. However, this was not the first rebellion, as 145 years earlier, encouraged by the rebellion in Palermo, the Maltese had rebelled against the Angevins. Both events have many similarities. Roger learnt this and sent his own fleet to support the Maltese. Arriving at night, he made contact with a besieger and sent a sentry boat into the harbour. It reported that the Angevin galleys were beached under the castle walls. Roger moved his galleys into line abreast at the entrance to the harbour, silencing the guard boats in the process, and connected his ships together. At about dawn he ordered a trumpet challenge to be sounded. His reason for doing this is not clear. Perhaps he wanted to show the bravery and boldness of his crews, or to prevent anyone from saying he could not have won if the enemy had been awake, but since he later attacked a sleeping enemy, it would seem that he did it to draw the Angevins out to his prepared position. It would have been difficult for him to attack in the confines of the harbour, and he would have lost the element of surprise anyway. Beached galleys were almost impossible to defeat in close combat, as they could be continually reinforced from shore. The Angevin crews rushed to launch their galleys, and they moved out in a disorganised manner. Roger first used his Catalan archers, and then closed for hand-to-hand combat. Cornut was killed by Roger in single combat when he boarded Roger’s flagship, but Bonvin broke through the line with some galleys and escaped. The Aragon fleet consisted of probably 22 galleys. The Angevins had about 19 galleys, of which 10 were captured by the Aragonese. Roger (Ruggiero) of Lauria, (c. 1245-January 17, 1305), was a Sicilian-Aragonese admiral who was the commander of the fleet of Aragon during the War of the Sicilian Vespers. He was probably the most successful and talented naval tactician of the medieval period. After the Sicilian Vespers revolt in 1282, which made the Aragonese rulers of Sicily, he fought and won six naval galley battles in total. On July 8, 1283, he defeated the Angevins in Malta’s Grand Harbour. On June 5, 1284, in the Battle of Castellammare, he defeated the Neapolitan fleet and even captured the enemy commander, Charles of Salerno, who later became Charles II of Naples. On September 4, 1285 in the Battle of Les Formigues during the Aragonese Crusade, he defeated the French near Barcelona, which destroyed the French naval power in the Mediterranean for a long time. Within days, he landed and took part in the Battle of the Col de Panissars. On June 23, 1287, in the Battle of the Counts, he again defeated the Angevins near Naples, despite the fact that his fleet consisted of only 40 ships against the enemy’s 80. Thus the Battle of Malta, which is hardly known at all in these islands, was of great importance and changed the future of the Mediterranean. Roger was successful in naval warfare because of several skillful tactics. He tried to lure enemy fleets out of defended ports, pretending to retreat and getting them to chase him until they became disorganised, then turning in formation to attack. He had much more control over his captains than his enemies did. His crews were made up of specialised troops, instead of the more generic types used by his enemies. 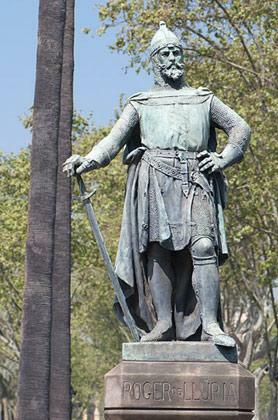 His Catalan archers were used initially, while his oarsmen and/or almogàvers (unarmored and highly mobile elite troops armed with two javelins, a lance and a dagger) stayed under cover. When the galleys closed, often from the sides of the enemy galleys (which damaged their oars), these almogàvers were much more agile than the heavily armoured knights with swords his enemies often used, especially on the moving deck of a galley at sea. He used trickery to disguise the size of his force. In addition, he sometimes kept some of his galleys hidden, to attack the rear of the enemy after the battle had started. Roger was also infamous for the ruthless sackings and the devastation of his actions, often driven only by greed and personal advantage. His reputation alone possibly caused some enemies to lose heart during a battle.